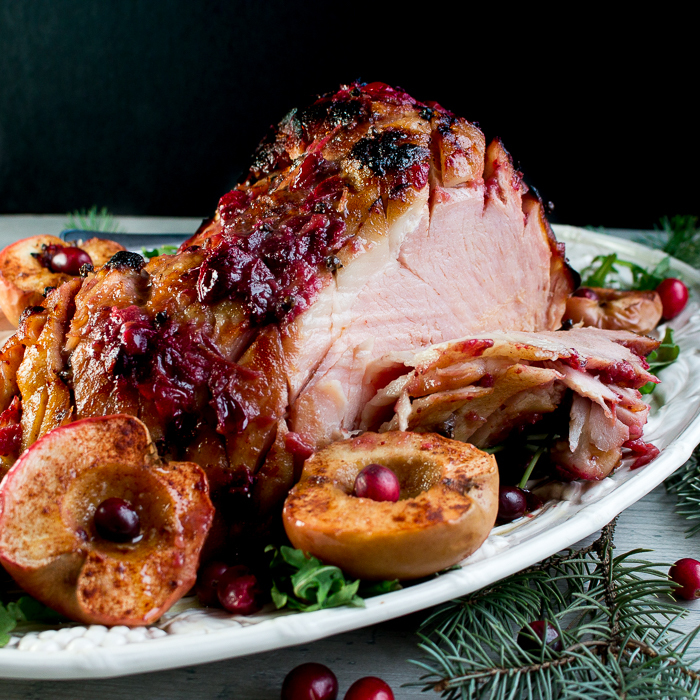 Spiced Cranberry Glazed Ham tastes just like the holidays with cloves, cinnamon, ginger and cranberry glaze on top of a golden studded ham and cinnamon baked apples. You are just going to love the crispy cranberry spiced skin of the ham and super juicy ham on the inside. 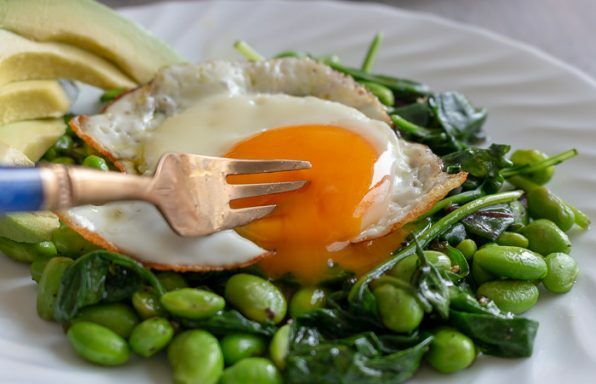 Don’t you just love something a little sweet with the salty ham? The perfect pairing. However, we did not want to use brown sugar and honey and all that refined sugar. Instead we used spices and just a little bit of sugar alternative and the natural sweetness of the apples do their work. 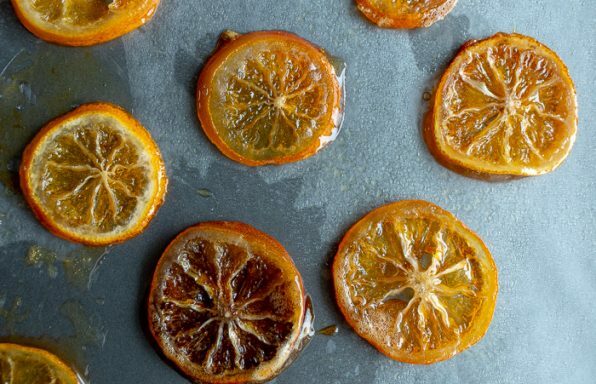 Holidays are right around the corner and we wanted to give you a super easy recipe that is going to make you a hostess or host the star of the day. This recipe could not be easier as it has only a handful of ingredients… ham, cloves, fresh cranberries, sugar alternative, apples, and cinnamon, ginger and orange zest. That is it… ! We slathered the homemade easy peasy cranberry glaze on during the cooking process and made a little extra to serve on the side and as a dipping sauce. Highly recommended! 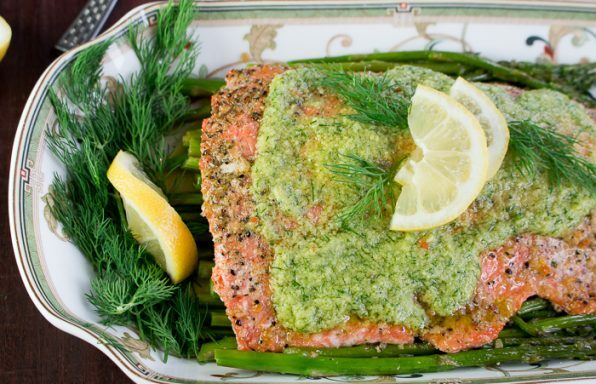 The oven will do all the work so you can enjoy your guests. We used a fully cooked bone in ham rump portion at about 8 pounds. (3.6 kg). You should figure on about 3/4 to 1 pound of bone-in ham per person. This ham could surely have fed 8 people but instead we just wanted a big ham so we could follow the cook once and eat twice or three times rule. 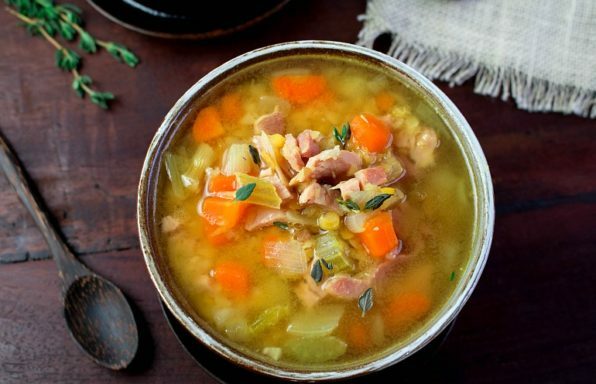 Be sure to try our Curried Ham Lentil Soup with your leftovers. 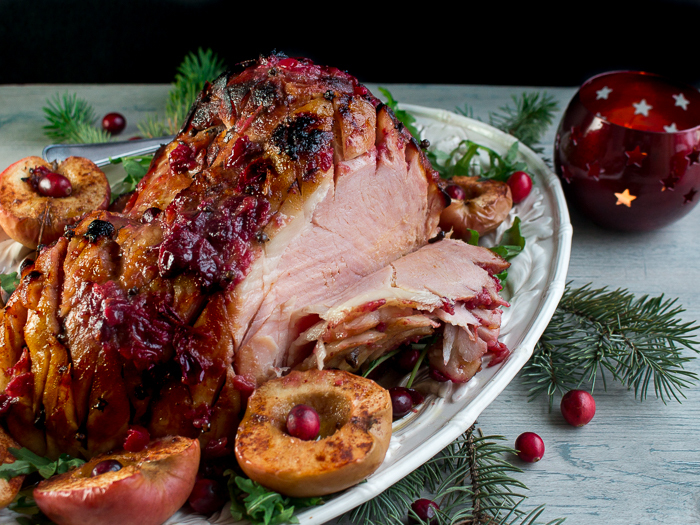 Spiced Cranberry Glazed Ham is all about that delicious spiced cranberry glaze. Cranberries are in season, on sale and are so festive. We made a super simple 10-minute glaze with cranberries, ginger, cinnamon, orange zest, sugar alternative and little water for a delightful cranberry chutney. The cranberry glaze is a little bit tart, a little bit sweet and a little bit spiced. We made the whole bag of cranberries as the cranberry sauce is delicious spooned over the Spiced Cranberry Glazed Ham upon serving. If you are going to be firing up the oven, you might as well throw in a few delicious treats in your baking pan. 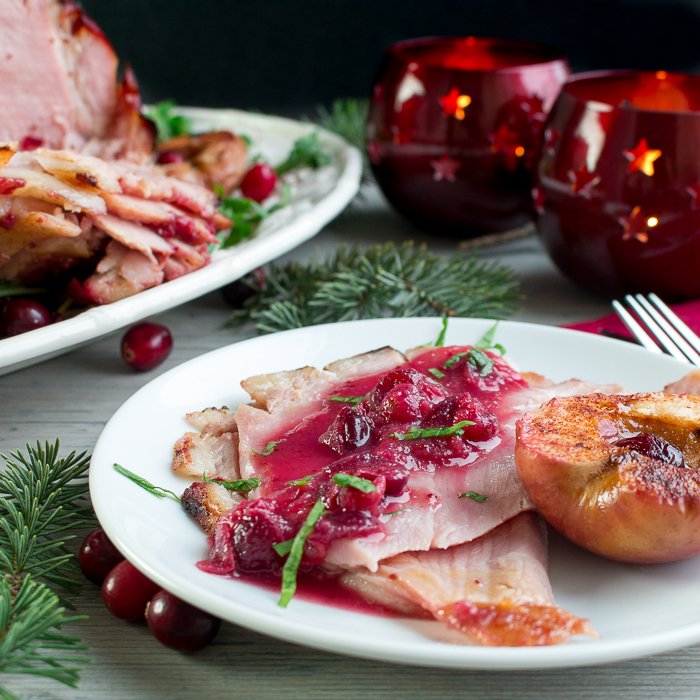 Apples are the perfect accompaniment to Spiced Cranberry Glazed Ham. We just cut them in half, removed the core and sprinkled them with sugar and a tiny bit of sugar alternative. 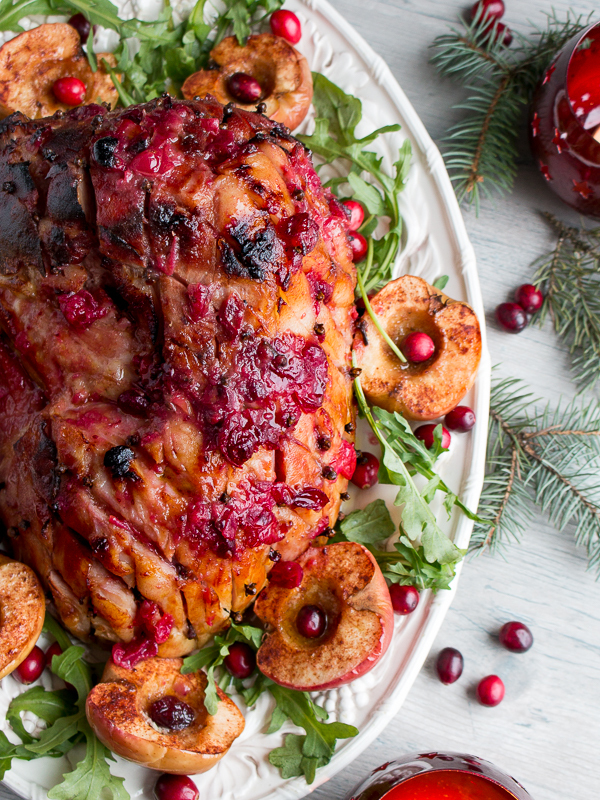 Spiced Cranberry Glazed Ham works perfectly with the sweet and salty combo. 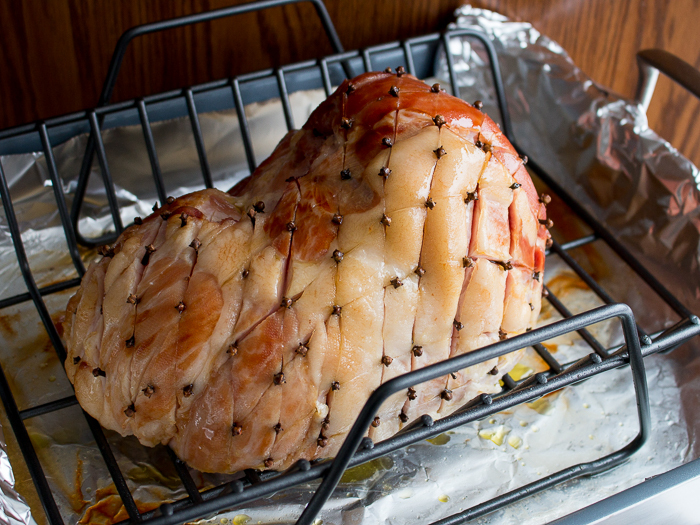 Spices that kick up a good ham are whole cloves and look how beautiful they look on your studded Spiced Cranberry Glazed Ham. You should remind your guests not to eat the cloves. If you are looking for a delicious side to accompany your Spiced Cranberry Glazed Ham be sure to try our Holiday Salad and Spicy Rosemary Butternut Squash or Vegan Ginger Cumin Carrots. We are wishing your family a safe and happy holiday from the Healthy World Cuisine Family to yours! 1Preheat oven to 325 degrees F or 162 C.
2Cut diagonal slices into your ham on the fat side – stud each diamond with a whole clove. Rub your ham with olive oil and place cut side down in roasting pan, place about 1 cup water at the bottom of the pan, Cover your ham with aluminum foil. Bake for 1 hour. 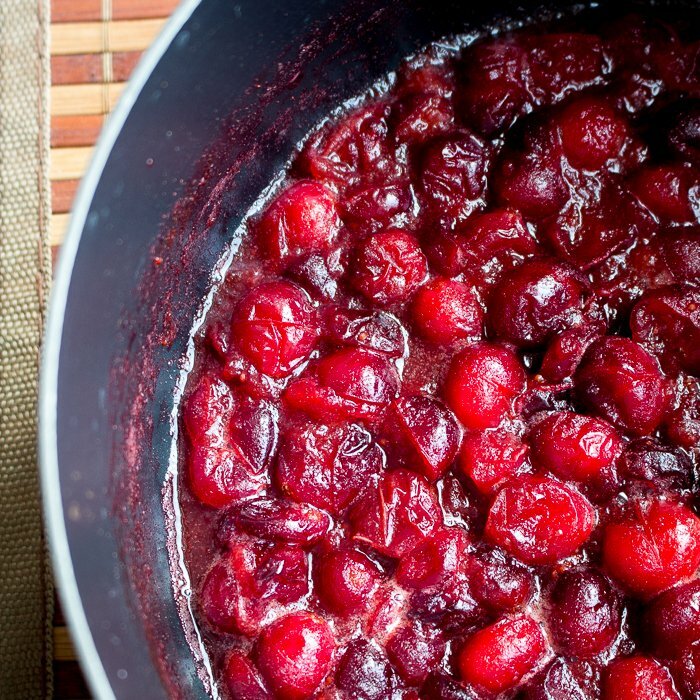 3Make your cranberry sauce- add the cranberries, 3 tablespoons sugar alternative, 1 cup water, ginger, 1 teaspoon cinnamon, salt and orange zest into a pan on the stove top and cook over medium heat until the cranberries break down and warm and bubbly. 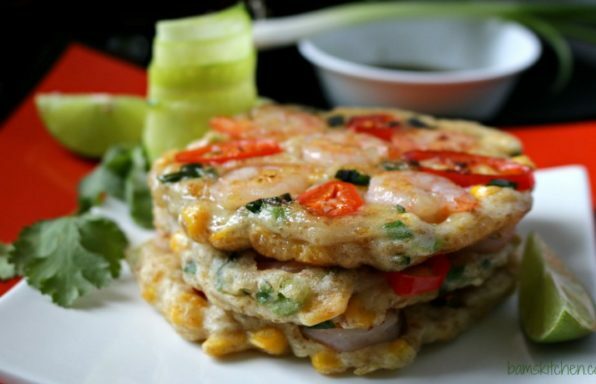 We like ours a little chunky but you can cook and puree until smooth, if you wish. Set aside. 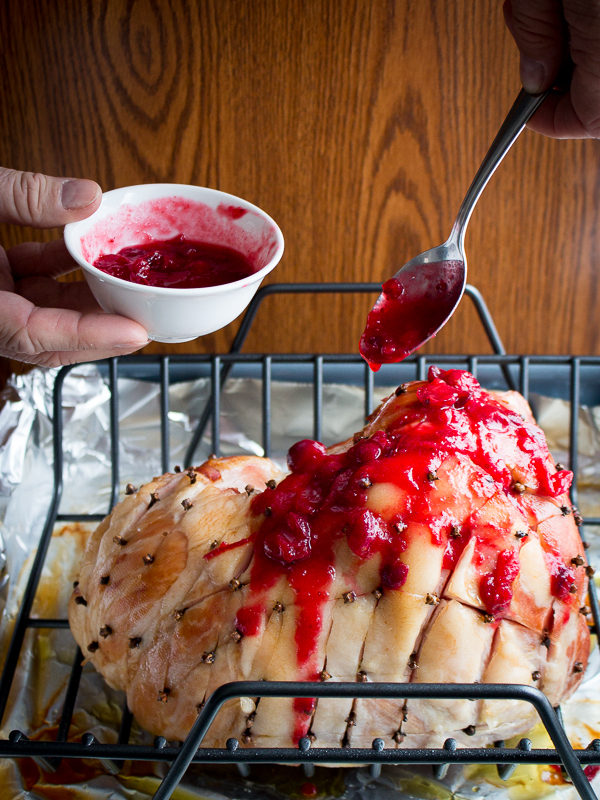 4Remove the aluminum foil from your ham and glaze your entire ham with the cooked cranberry sauce. For each pound of pre-cooked rump ham cook according to the chart above in the post. 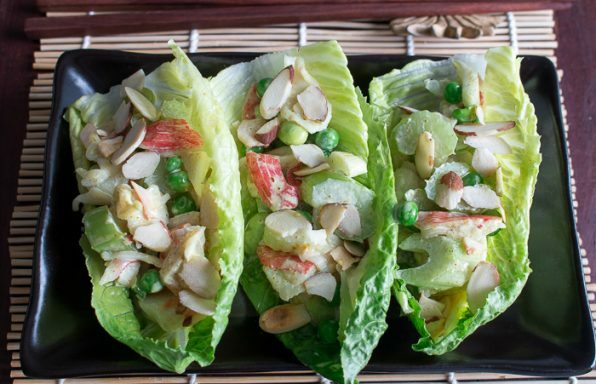 Place your halved cored apples in the roasting pan and sprinkle with a little cinnamon and sugar alternative. The total time in the oven for our 8-pound bone in ham was about 2.5 hours. 1.5 hours was with glaze. Brush every 15 minutes with a little additional cranberry glaze. 6Check to confirm that the internal temperature is 140 degrees. 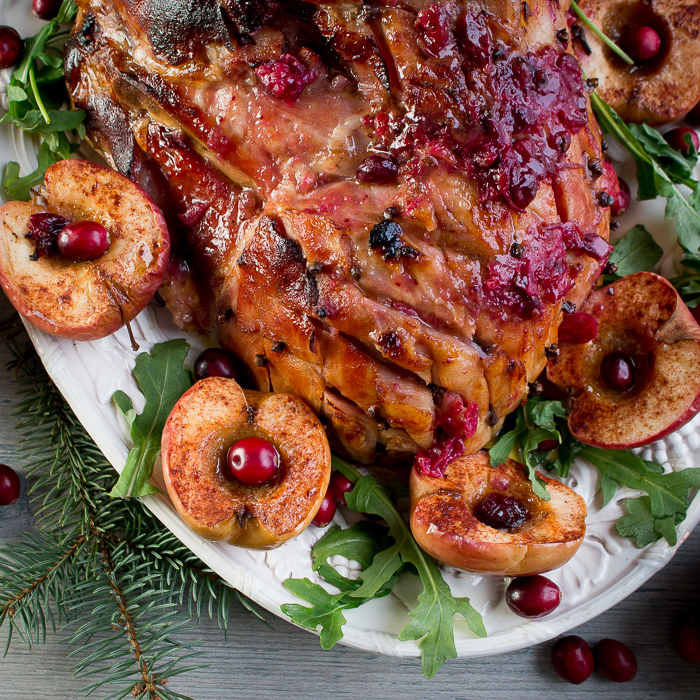 Rest your ham for 10 minutes and slice thinly and serve with a little extra warmed spiced cranberry sauce and baked apples. 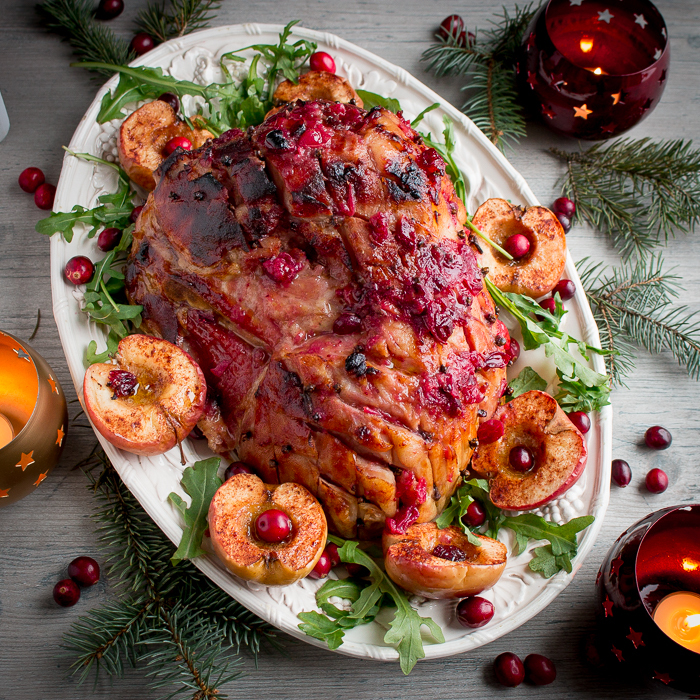 Garnish your ham with fresh cranberries and greens for a festive dining experience, if desired, Enjoy!